Sarah Huckabee Sanders was on fire defending President Donald Trump’s call to action on the Southern border. 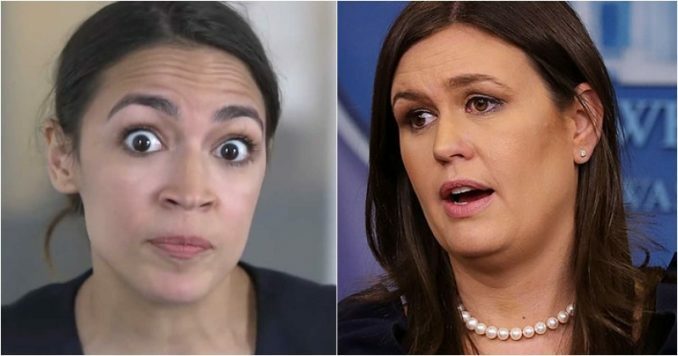 Part of the problem is Democrats like Alexandria Ocasio-Cortez who claims, “All Latinos have a race-based right to migrate to the United States.” Well, Sarah just torched AOC and her cohorts with a flamethrower. You’ll love this. Alexandria Ocasio-Cortez has become the new face of the Democratic Party. The former bartender speaks, and the rest of the Democrats nod in unison. And besides her ridiculous Green New Deal, AOC has been really vocal promoting open borders. Now, every Democratic candidate for president has adopted the disastrous open border policy. And their cohorts in the courts, the Obama-appointed judges are causing mayhem. The 29-year-old Congresswoman said, “All Latinos have a race-based right to migrate to the United States.” But that’s not all. So, let’s get this straight. AOC claims all Latinos should be able to just walk right into America and say, “This is our land.” This may sound bonkers to you, but this is exactly what the fringe far-left organizations like La Raza stand for. This is nothing new, but up until last year, no self-respecting Congressman would ever condone open borders. Welcome to the new rabid far-left Democratic Party. And thanks to AOC, we just received another blow from the leftist courts. “A federal judge on Monday blocked an experimental Trump administration policy that requires asylum seekers to wait in Mexico while their cases make their way through the U.S. immigration court system, a major blow to President Trump’s efforts to stem the surge of crossings at the southern border,” the Washington Post reports. That means every migrant who presents themselves at our Southern border will be allowed to enter the United States. Sure, they will be told they have to show up at a court hearing, a court hearing they will never show up for. With record numbers coming every day, this activist judge just followed AOC’s crazy and dangerous open border policy. Mexico was in agreement that they would hold the migrants on Mexican soil until they got fed up and returned home or until U.S. judges could hear their case for asylum. Now, this Obama judge decides the United States can’t house the migrants on Mexican soil. It’s idiotic. Senator Tom Cotton, a major Trump supporter, was also livid. “Another crazy immigration ruling from activist Obama judge. Even if Mexico agrees to keep migrants, judge says no! Must release into our country! Democrats will do anything for open borders,” Senator Cotton tweeted. The point is almost 99% of these migrants have no case for asylum. They are being used as pawns by leftist organizations that are being funded by Democrats to encourage the migrants to come to the United States. It’s a big game. Think about it. How are these poor migrants sustaining themselves on this 6-week trip? These Democratic-funded organizations are giving them food etc. “Meanwhile, the U.N. is committing resources to the [migrant] caravan. In essence, it uses U.S. taxpayers’ money to fund a violation of their own border. That way, the U.S. can join all the other countries with a mass immigration problem,” Investor’s Business Daily reported. In other words, the U.N. has set up shop in Mexico and is pushing these migrants to go to the U.S. Once again, the U.N. violates a member nation’s right to protect its own borders. Fortunately, President Trump is having none of it. For those who have suggested Trump’s move is illegal under the “Posse Comitatus” Act of 1878, they’re wrong. That law’s letter and intent were to keep the U.S. from using federal military troops against its own citizens. No one intended for this law to force our borders open to those who would violate our sovereignty. Sarah Sanders is right. It’s AOC and her Democratic cohorts who are aiding and abetting the migrants, who are just pawns, to cause the border crisis. They have powerful friends at the United Nations, and there is one man standing in their way: President Donald Trump. Every American citizen needs to learn the entire truth and do whatever they can to spread this information far and wide. AOC needs to study “THE CONSTITUTIION” to be able to DO HER JOB. Right now, everything she has blurted out is against the Constitution. Didn’t she take an oath to protect the laws of this country and the Constitution or is she doing what Obama did – an enemy of the U.S.?